Here's where to watch every episode of Love Thy Neighbour season 4. Mouseover or tap an episode to see where to stream it. Click or tap the play icon to stream it on the best available service. 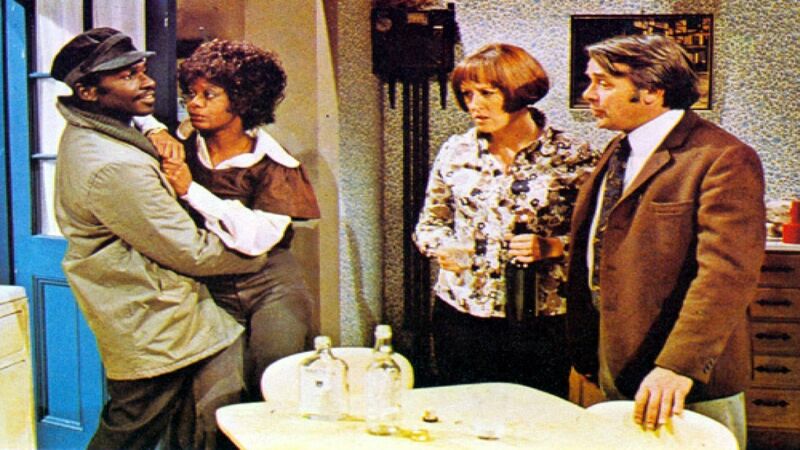 Hines' Sight Dec 12, 1973 Joan & Barbie are now members of their own special "club" but has Eddie thinks he's evened out the white to black ratio, a new neighbour looks to upset the balance. But who is moving in and who is moving out?? Friendly Dec 19, 1973 Eddie's day is slowly going from bad to worse. First he's had to do the housework, then Manchester United, his beloved team, have lost 3-0 and Bill has won the top prize of a trip to Paris in the social club raffle. With an extra ticket up for grabs, Eddie begins his "Creep Your Way To Paris" Campaign. Working on New Year's Eve Dec 31, 1973 Eddie & Bill have been called into work on New Year's Eve, leaving a very pregnant Joan and Barbie alone at home. Not one to miss out on a good celebration Eddie decides to throw a party at the factory, whilst the wives are having problems with an intruder. Eddie's Mother-in-Law Jan 7, 1974 There is only one person Eddie dislikes more than his next door neighbour and that's the mother-in-law Mind You, the feeling is mutual Joan's mother has never made a secret that she thinks her Daughter married below her station. Ding Ding, Let The Fight Begin. The Ante-Natal Clinic Jan 14, 1974 After a Father's Evening at the Antinatal Clinic, Eddie and Bill strike up a bet: can Eddie last 24 hours without insulting his neighbour? it's goung to tahe an awfull lot of willpower, especially as Bill is going out of his way to provoke a verbal attack. Two Weeks to Babies Jan 21, 1974 The countdown to the big day has started, but so have the rumours, Are Eddie and Bill really the fathers of their unborn children or has Specky Nuttall, the window cleaner, been doing more than he's being paid for? To the Hospital Jan 28, 1974 Like any good husband Eddie is taking no chances when it comes to getting Joan to the Hospital on time. The route has been planned and he's borrowed a car, nothing can go wrong... or can it?